If you’re thinking of treating someone special to a new piece of jewellery this Christmas, you will be delighted with the array of lovely things available at Cupitt Jeweller in Bromsgrove. After 65 years in business, the family-run firm has a well-deserved reputation for quality products and excellent service, and its membership of The Company of Master Jewellers (the largest independent jewellery buying group in the UK) allows access to a wide range of product lines. Owners Simon and Åsa are constantly introducing exciting new brands, and the latest collections offer plenty of inspiration for festive gifts. Cupitts have just introduced a range from designer Babette Wasserman, who works with rose gold and silver to create exciting and unusual necklaces, earrings, rings and bracelets. The Meadow collection offers a range of pendants in glittering silver, which can be bought separately and combined on one chain for a unique necklace. 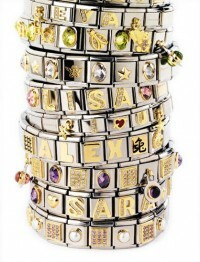 Starting at £30, there are 24 designs to choose from, with new ones frequently arriving in store. Similarly, the Nomination collection enables you to create a bracelet – start with the stainless steel base and add the 18-carat gold links to build up your own design. Also available at Cupitts are Rist and BREO watches, which are very much in fashion at the moment; the funky rubber watches are available in a spectrum of vibrant colours and designs. Cupitts now sells a brand called From Soldier to Soldier, designed for the Help the Heroes campaign. Made from parachute cord with silver fittings, the bracelets for men and women are stylish, durable and fashionable. The latest collections from some of Cupitts’ most popular ranges are now in stock, including rainbow designs by Coeur de Lion and beautiful sparkling pieces from the two prestige diamond brands, MasterCut and Hearts on Fire. 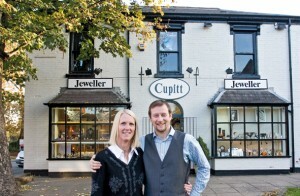 Cupitts is one of the biggest stockists of Lovelinks, the highly desirable build-your-own jewellery range. Don’t forget to check out the gentlemen’s jewellery by Unique, plus the beautiful ladies’ collection in millefeuile Murano glass and silver. As always, the mix of traditional and modern ensures there’s something to suit a range of tastes, ages and budgets. Alternative gift ideas include jewellery boxes, clocks and glassware, and of course Cupitts offers a full gift wrapping service. In keeping with its ethos of personal service and expertise, Cupitts has a workshop on the premises where repairs and alterations are carried out and commissioned items are created. Feel free to call in and pick up a catalogue showcasing the latest collections in the run up to Christmas.